Acidic Waters Hostile to Shellfish – Neptune 911! WALPOLE, MAINE — In the icy waters of midcoast Maine, Bill Mook has his eyes on his oysters – and how the waters they need to survive are gradually, but clearly, changing. Down the coast near Portland, the issue is clams and the mud flats that have become inhospitable to their survival. Ocean acidification is sometimes referred to as “the other carbon dioxide problem,” and it’s exactly what the name implies: the gradual increase of acid in the world’s waters. It’s fueled by the burning of fossil fuels and the massive amounts of carbon that releases. A good chunk of that is absorbed by the world’s oceans, making the water more acidic. Additional acid makes it hard for some species to develop the shells they need to survive. And that’s instilled fear in government and fisheries leaders around the country. In Washington state and the Pacific Northwest, the issue hit home between 2005 and 2009, when acidified conditions killed billions of oyster larvae at two of the main hatcheries that provide Pacific oysters to growers. Hatcheries scrambled to boost the monitoring of ocean chemistry and to adapt growing methods to avoid particular acidic waters. The Natural Resources Defense Council, an environmental advocacy group, points to other hotspots: in the Gulf of Mexico, coastal California, Alaska, Maine, North Carolina and the Chesapeake Bay region, all of which have important seafood industries; and in Florida and Hawaii, which have coral reefs – and associated tourism – to protect. But while carbon-fueled climate change is a hot issue politically, its sibling – ocean acidification – has escaped much public notice except in the affected regions. The U.S. Government Accountability Office noted in a September report that the “current rate of acidification is believed to be faster than at any point in at least the last 20 million years.” But, it added, the federal government hasn’t done as much as it could have to implement a 2009 law to respond to the potential crisis, such as developing adaptation strategies. Here in Maine – where lobster is king and oysters, clams, eels, scallops and other species round out a thriving seafood industry – members of the state commission decided they couldn’t wait for the federal government to act. “Perhaps the most alarming of the commission’s findings is how much we do not know about ocean acidification and how it will affect Maine’s commercially important species, including the iconic lobster,” a state commission on the issue recently wrote. It said actions “can and must be taken to understand, prevent, reduce and mitigate the negative impacts” of the phenomenon, and noted that there are so-called “mud flats” in Casco Bay off Portland where juvenile soft-shell clams struggle to survive in acidified conditions. The Mook Sea Farm combines sophisticated oyster breeding with a rugged growing operation. Inside its hatchery, nestled at the end of a gravel road about an hour’s drive northeast of Portland, adult oysters are bred to produce about 100 million juvenile oysters – seed – annually. Most of those are sold to other growers, from the Northeast to the Mid-Atlantic. The rest are grown in the warm, salty waters in the upper part of the Damariscotta River, a long embayment of the Gulf of Maine, where they become – depending on size – Wiley Point or Pemaquid Point oysters and are destined for sale in the half-shell market. One frigid day in early January, three of Mook’s workers loaded dozens of bags of oysters and set out for an icy ride downriver, to put oysters too small to sell back into cages at Mook’s winter harvest site. The winter harvest leases contain hundreds of cages affixed to air-filled floats. Once there, Jeff Auger, Nate Jones and Luke Gardiner grabbed bags of oysters from three containers they’d loaded onto the boat and slid them into empty, ice-encrusted cages. Then they flipped the cages over, so the oysters were submerged but still floating at the top of the river. 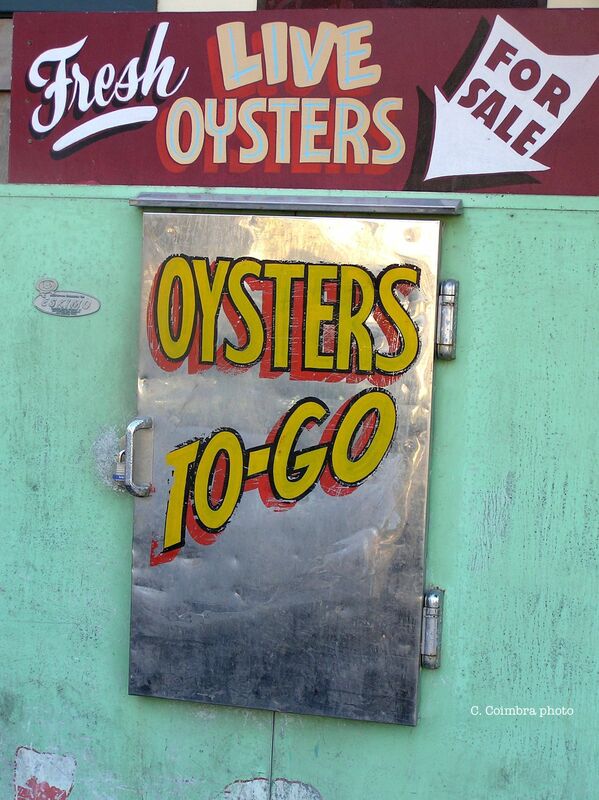 Oysters spend the first two or three months of their lives in the hatchery, and then a year or more in the river. Jones steered the boat to another set of cages, where the men pulled bags of ready-to-ship oysters out of the river and loaded them into the boat. Those oysters might be on a restaurant plate within a week, getting shipped as near as Boston and as far as Los Angeles. Mook’s operation is 30 years old, and during that time he’s seen the salinity – salt content – of his river water decrease, a consequence of more rain, which researchers tie to climate change. During a particularly rainy year about five years ago, excess runoff from the land also increased the acidity in his waters, slowing the growth of larval oysters in the hatchery. That runoff is a form of coastal acidification, basically a subset of the broader ocean acidification phenomenon. About five years ago, after acidic waters walloped the oyster industry in the Pacific Northwest, Washington state fishermen came to talk with their peers in Maine. On both coasts, they’ve begun to modify their growing strategies – pumping water in at different times, for example – to avoid the increases in ocean acid. The Maine commission, which also relied on the experiences in Washington state, met several times last year, and discovered how little scientists know about acidification. Among other things, the commission said Maine needed to boost research into acidification and its impact locally, increase monitoring of water chemistry to better detect emerging problems, reduce pollution discharges that end up contributing to ocean acidification, and do what a small state such as Maine can to help reduce carbon dioxide in the atmosphere. The commission expects to finalize its report this month.